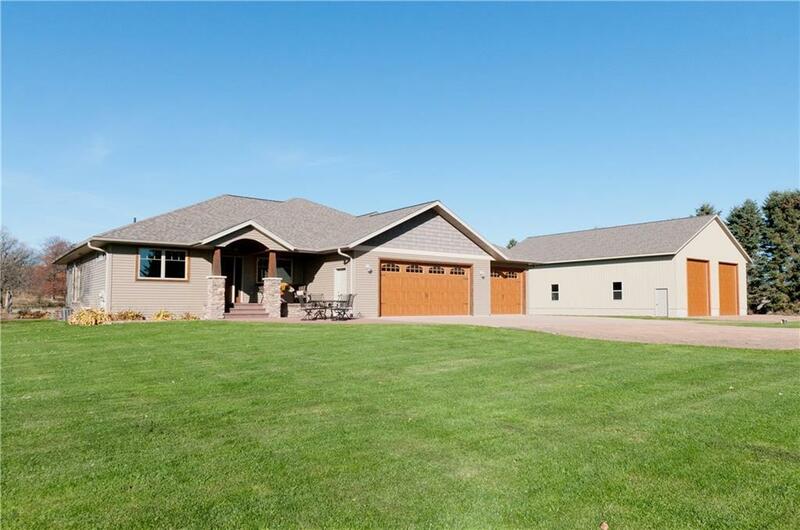 Newer ranch home with a nice open concept on 5 acres just outside of town & close to Hwy 53 for easy access, & centrally located between Rice Lake, Bear Lake, Red Cedar & Long Lake. This home offers a spacious master suite with a walk- in closet, tiled shower, jacuzzi tub & heated floor, 3 additional bedrooms, tray ceilings, main floor laundry, custom kitchen cabinets w/under cabinet lighting, 2 gas fireplaces, fully finished basement with 8’8 ceilings, great for entertaining with a bar, all in-floor heat in lower level including in the attached 3 car garage, seamless gutters, stamped concrete patios, stairs from garage to basement. Property also includes a newer 40x60 stick built detached garage, all concrete floors, 16 foot side walls, 2-12ft wide x 14 ft tall insulated overheads & one 10x8 and has a large storage loft, additional 10x14 shed & property is set up with fencing for animals including a lean to covered shed. Property is broker owned.